This 890 km trail runs between Queenston, in the Niagara region, to Tobermory in the Bruce Peninsula. As you hike along the Bruce trail you will see the spectacular scenic vistas overlooking Georgian Bay with the escarpment as the backdrop. This is Canada's oldest and longest footpath. Uncover some of the most incredible views of Georgian Bay, where eagles soar across the high cliffs. Look down and bear witness to the primitive rock formations piled high through the crystal clear turquoise waters of Georgian Bay. From Wiarton to Tobermory, you might spend a good eight or nine days hiking at a comfortable pace, stopping to picnic or to take a swim. With each step, you move further and further away from the stresses of modern life as you experience an outdoor adventure that is 360 degrees away from it all. Look closely and you’ll discover that 400 million years ago, this land was submerged under a tropical sea. Look closer still, and you’ll see layers of embossed, fossilized coral shielding dolomite and limestone … rocks that erosion has carved out with hidden caves and overhanging cliffs. It’s here that you’ll find geological treasures such as the Grotto, a cave scooped out of the cliffs by the waves of ages, and Overhanging Point, a massive bowl-shape that has been hollowed out of a cliff. Starting at the Cyprus Lake Trailhead, choose the loop that also takes you to the Grotto and Indian Head Cove. The woods portion of the hike is quite easy, but once the trail takes you to the rocky shore, you’ll understand why sturdy hiking boots with grippy soles are needed. Even in good weather, it can be slippery to navigate. Once you arrive at Overhanging Point you’ll see why people rave about the breathtaking view. TIP: There’s an easy-to-miss hidden rabbit hole that can take you down to the Overhanging Point amphitheater below. Moving on to the Grotto, if you pick your way down to the shore, you can see the underwater cave on sunny days. If beaches are your thing, there are some spectacular sites to be found between the Grotto and the Halfway Log Dump Side Trail. Fantastically eroded rocky spires and partially submerged slabs of rock greet you. As you continue on to Indian Head Cove, another tourist favourite, you’ll find the breathtaking lookout features the cliff plunging straight down into the waters below. TIP: The Overhanging Trail Loop and the Grotto are very busy in the high season. If you want a more secluded adventure, visit in the spring, fall or during the winter. In summer, bring water shoes, they’re helpful for navigating slippery rocks. What’s a flowerpot? Find out when you hike to the Devil’s Monument - the largest of the Bruce Peninsula’s flowerpot formations and one of the many spectacular places along the craggy shoreline known for incredible views. Park at the Bruce Trail lot near the end of Borchardt Road. The walk to the Devil’s Monument is actually quite short, but the access trail is steep, rocky and slippery. The hiking is not too difficult, but it’s not a good place to take young children or dogs. Bring sturdy footwear, a walking stick and watch out for poison ivy, it's easy to avoid if you know what it looks like. Take the trail and stairs down to the gorgeous rocky beach. You may want to bring a picnic, bathing suit and swim shoes if it’s a hot day and the clear water beckons. The shallow bay water warms up in summer. At just under an hour, the Minhinnick Side Trail will take you around and back to your car. With Lion’s Head and Isthmus Bay just to the south, White Bluff is an easily recognizable landmark, with its craggy cliff towering above the water, topped by a layer of primitive white rock and forest. Located within the Smokey Head White Bluffs Nature Reserve, the White Bluff Loop offers three different trails running anywhere from 2 to 4-hours in length. They all offer incredible views across Isthmus Bay. Park your car at the Bruce Trail lot on 40 Hills Road and follow the signs. You’ll find that the terrain is less steep here at White Bluff, making these trails a little more forgiving for beginning hikers. If looking out over incredible turquoise and ultramarine blue waters from a stunning 200-foot cliff gives you a thrill, the main Lion’s Head Trail is another one to explore. A forested trail leads before emerging onto some of the best views on the Bruce. On a clear day, look to the south from the cliffs and you'll see Cape Dundas and Barrier Island and to the north, you’ll see the cliffs of White Bluff, Cape Chin, and Cabot Head. The Lion’s Head Trail has two loops – the main trail and inland trail for a total of about 18-kilometres. The trails are marked with blue and white blazes. TIP: Bring a walking stick as parts of these trails can be challenging. Some of the trails are not recommended for young children or dogs. Bring a harness if you have a young child. There are crags, sinkholes, and no handrails. An easier hike starts right at Lion’s Head Beach Park. Cross the Promenade to the marina and walk north along Bruin Lane. The Bruce Trail cuts into the woods at this point. It’s only a ten-minute walk to Chetwynd Lane where you would turn around, but in between are Williams Cave and the Bannister Hill Loop Side Trail which is a pleasant one kilometre hike where you’ll discover forest, a variety of lookouts and escarpment views. If variety is the spice of life, you’ll explore a lot of visual flavor following the White Blazes of the Bruce main trail heading towards Jackson Cove Lookout Side Trail. On your way, discover a view for everyone. One minute you’ll be traversing the trail along the escarpment edge and in the next minute, you’ll be on the beach marvelling at the crystal-clear water. Minutes later you’ll be marching across a field, then you’ll hit the forest, then a riverbed – there’s an ever-changing variety of terrain and viewpoints on this hike. The Jackson Cove Lookout Side Trail offers two kilometres of stunning views including Jackson Cove and Hope Bay. TIP: There are platforms and benches for those wanting to linger or create a great photo op. Backtrack from here to the Cape Dundas Loop. Hope Bay features the Jack Poste Side Trail, an easy, but longer, four kilometre loop; it is here that you’ll uncover the site of the popular glacial potholes, created by a late stage of glaciation. Meltwaters running over the escarpment created small eddies that eventually carved these potholes out of the bedrock. Who was Jack Poste? He was a Flying Officer, holder of WWII's Distinguished Flying Cross (DFC), schoolteacher, historian, environmentalist, and a much-beloved, early champion of the original Bruce Trail. He was a local character, often opening his home to trail volunteers. Take the Don Irish Side Trail off Cathedral Drive or descend the gravel track from Bruce Road 9 until you see the blue blazes. This trail climbs and descends several ridges, gradually climbing to an old logging track that was used to bring timber to the log dump above Hope Bay. TIP: The glacial potholes are near where the main trail again joins the Jack Poste Side Trail. This trail features an abundance of trilliums in May. Sydney Bluff features the Ladder Trail - a dead-end hike with a crazy steel staircase climb to the top of a bluff with a 100-foot drop and amazing views of Georgian Bay. Access to the start of the hike is through Cape Croker Indian Park. From the car park, you can see the bluff rise majestically before you. The ascent to the top of the trail offers hikers a good work out. The top of the escarpment features an undulating trail that ends with the lookout. This point is a must-see location to discover a bird’s eye view of the fall colours on the Peninsula. TIP: Rainy weather and wet leaves can make the ladder slippery. It is not accessible for dogs. The Jones Bluff Loop is not for the faint of heart. While the trail offers a relatively easy hike with beautiful scenic lookouts, be forewarned that his loop means business with an endurance-testing 8.5-kilometre trek. Pack water, food and be ready for changeable weather. It’s a three to four hour hike with no shortcuts! Parking is at the Bruce Trail lot on Boundary Road. Discover what it’s like to touch the clouds as you look over MacGregor Harbour where Cape Croker juts into the water. From your perch, you’ll see Sydney Bluff, Cape Dundas and Barrier Island in the distance. While you don’t reach the shoreline on this trail, you’ll hear the sound of surf meeting the shore as you traverse forest and rocky outcrops, eventually stealing glimpses of Colpoys Bay, White Cloud and Griffith Islands. The Purple Valley Access Trail can be found in the Malcolm Bluff Shores Nature Reserve. The 423-hectare reserve is located on the north shore of Colpoys Bay, near Wiarton and includes four kilometres of shingle beach shoreline and forested land. The Bruce Trail crosses the property, running along the top of the escarpment. The views from the trail looking out across Georgian Bay are spectacular. If you’re going through Wiarton take note: the trail is a little tricky to find but well worth the effort. From the centre of town, follow Highway 6 north three kilometre and turn right onto County Road 9. Follow County Road 9 and turn right onto Purple Valley Road. Continue down Purple Valley Road to where the road turns left. Continue straight through the intersection on Wright’s Crescent. Continue to the bend. Look for the Purple Valley Access trailhead on the right, at the bend. Parking is located on the right, just beyond the 90-degree bend. This trailhead is the entrance to the main section of the Bruce Trail that runs through the property. This easy, one-hour loop takes you past the site of the Corran, a crumbling ruin that was once the site of a stately 17-room stone mansion built in the early 1880’s by a wealthy lawyer and politician. The name means ‘land running into the sea’. It was reported that in 1901, a procession of horse-drawn carriages lined the streets of Wiarton, all the way up the steep hill to the stone gates on their way to an event at the Corran. Explore the ruins and close your eyes to imagine the grand parties that were held here, once the region’s crown jewel overlooking Colpoys Bay. Sadly, a series of misfortunes lead to the downfall of the great house and its eventual ruin. Park at the Spirit Rock Conservation Area just off Hwy 6 north of Wiarton. Bring a swimsuit and swim shoes. TIP: Discover the spiral staircase that takes you down to the shoreline. 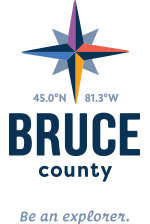 While it’s true that the entirety of the Bruce Trail offers 890-kilometres of hiking trails, many would argue that the part of the trail that cuts through the magnificent scenery and rugged landscape of Bruce County is the be-all and end-all for anyone with a passion for hiking. Our region offers such incredible and diverse terrain with hiking adventures across riverbeds, ancient forests, glacier-scarred rock, flower-filled meadows and rugged lookouts with shoreline beaches. This diversity is living proof and one of the many reasons why the Bruce Trail was instrumental in the escarpment being named a UNESCO World Biosphere Reserve by the United Nations in 1990 and is one of only twelve such reserves in all of Canada. Looking for a guided tour of any of these amazing hikes? Explorer's Tread offers up full, half, and multiple day guided tours! For more information about the Peninsula visit here.